Before October 2015, Brennan Farley had never broken a bone in his body. That changed dramatically when a horrific vehicle accident landed the 30-year-old farm worker in Mayo Clinic Hospital, Saint Marys Campus, for two months. Due to Brennan's extensive injuries, doctors were concerned he might not be able to walk again. But with the help of a supportive care team and the love and encouragement of his fiancée, Kayla, Brennan progressed enough in his recovery to go home in December 2015. And to walk down the aisle at the end of his wedding ceremony a month later, with a little help and with his new bride by his side. "The people at Saint Marys really cared about me," Brennan says. "They want their work to be great, and it shows. It really shows." And he would certainly need their best efforts. Brennan's ordeal began near the end of an otherwise routine autumn workday. Driving a 30,000-pound feed truck near the town of Rollingstone in southeastern Minnesota, Brennan was at the crest of a hill when he tapped the brake pedal and came to a scary realization. He had no brakes. "I knew I was going to need help. I knew it right away," Brennan says. He tried to hail his boss on his two-way radio, but it was too late. Brennan and the out-of-control truck careened down the incline and ran out of road at a T-intersection. The truck vaulted into a nearby creek embankment, where it lodged itself about 10 feet into the dirt. Brennan lost consciousness. Brennan and the out-of-control truck careened down the incline and ran out of road at a T-intersection. The truck vaulted into a nearby creek embankment. As a result of the accident, the truck's mixing tub was sheared off. It pushed the cab on top of the engine. Brennan's right leg was bent behind him and pinned against the engine. When he came to, Brennan grabbed his radio microphone, which was soaked with blood, and told anyone who could hear him he was in a ditch and needed a medic. Help came quickly. A co-worker who is also a first responder heard the call and raced to find Brennan. A passing milk truck driver stopped when he saw the wreck and called 911. A neighbor brought over a backhoe to help move debris. "There were some nice coincidences," Brennan says. "God was really looking out for me." Paramedics arrived to direct his care and guide the task of cutting Brennan free from the wreckage. After nearly four hours of effort, Brennan was moved to an ambulance and taken swiftly to Mayo Clinic Hospital in Rochester. The next week was a blur of surgeries for Brennan. His list of injuries included a crushed right heel, several broken bones in his right leg, fractured ribs, a damaged auditory canal, and a broken pelvis, tailbone and jaw. His colon had to be reattached. He suffered serious cuts under his chin and on his left leg. He had a partial tear to his sciatic nerve. His left forearm needed a tendon repair, and his entire right calf needed a skin graft. The injuries required Brennan to be in an intensive care unit at Mayo Clinic's Saint Marys Campus. During his stay, Brennan's spirits were buoyed by his care team, especially Mike Diekmann, one of his nurses. Mike shared his artistic talents by drawing in Brennan's notebook and leaving him encouraging messages. He also fashioned a race car out of hospital supplies to keep Brennan amused. "Whether it's good therapeutic communication with patients and their families, or something simple like drawing a picture to give them a smile after the worst days are behind them, we do whatever we can to make their time with us go as smoothly as possible," says Mike. "There were so many people instrumental in Brennan's recovery. I was just doing my part at the bedside." Through it all, Kayla was by Brennan's side. 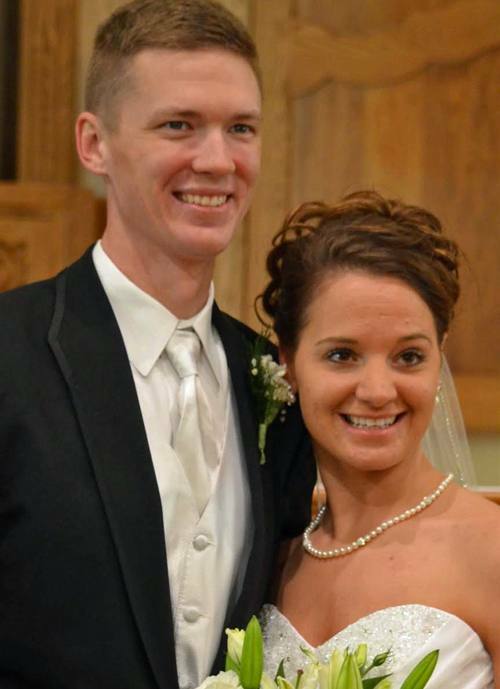 A nurse at Mayo Family Clinic Northeast in Rochester, Kayla wanted to help her fiancé while he was in the hospital. At first, though, she was at a loss to know what to do. "When he was in ICU, I more or less felt helpless," she says. One of the nurses on Brennan's care team, Rhonda Overkamp, saw opportunities for Kayla to put her health care experience to use. She allowed Kayla give Brennan a bath, brush his teeth, change his dressings, and help him feel comfortable. "When he was in the Intensive Care Unit, I said, 'I'm not going anywhere.' And he said, 'Damn right you're not,'" Kayla recalls with a laugh. "Brennan is one of those patients I'll never forget," says Rhonda. "The progress he made over his first weekend in ICU was remarkable. 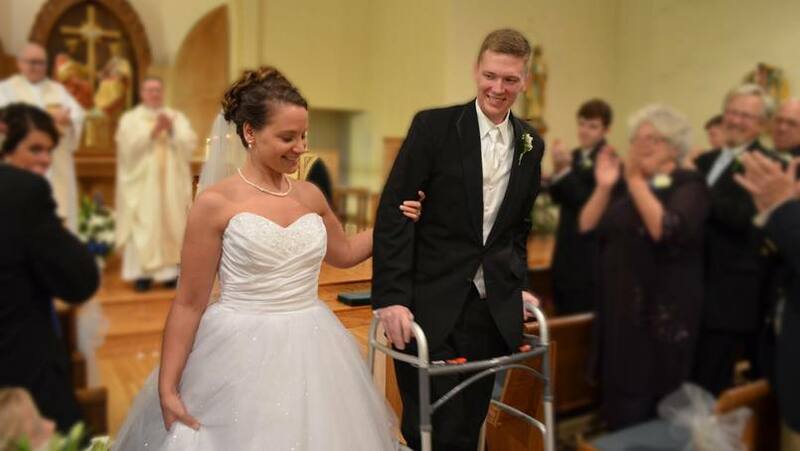 I am certain his determination to walk down the aisle with his soon-to-be bride kept him going. His story is a prime example of why I love what I do." As he recovered, Brennan moved to the hospital's acute care unit. There, he met Brianna Skrukrud, a nurse practitioner in Trauma, Critical Care and General Surgery, who he says was critical in aiding his recovery. "She was a daily visitor to my room," Brennan says. "If there was something medically that she had to talk with me about, she would do so, and then I would ask her to call Kayla and tell her what was going on. Brianna would go to the nurse's station right away and call Kayla, no questions or excuses." That extra step, he says, was crucial, as he was working through memory issues resulting from his injuries. "This extra effort that she did for us definitely made my recovery more enjoyable," he says. "Brianna has some of the best bedside manor that I came across." She was also one of the last people he saw the day he was discharged. One of Brennan's first exercises was to sit on the edge of his bed three times a day for 20 minutes. After seven weeks off his feet, he was able to walk 20 feet during his first day of rehabilitation. He used a walker to leave the hospital in early December. "I never thought I wouldn't walk again. I just knew it was going to happen," Brennan says. "I was going to make it happen, or I was going to find someone to make it happen." "He had that attitude from day one," says Kayla. "Since the beginning, he's been very positive and determined." That determined attitude helped as Brennan and Kayla planned a special surprise for the guests at their wedding in January. Brennan's parents pushed him to the front of the church in a wheelchair at the beginning of the service. Then, with the aid of a walker, Brennan stood for the ceremony. At the end of the service, the happy couple walked out to thunderous applause, cheers and tears. Even though he still has a lot of rehabilitation ahead of him, Brennan is hopeful he will be able to return to work soon. He and Kayla have delayed their honeymoon in anticipation of the progress he expects to make. "We have too many dreams to conquer yet," Kayla says. As Kayla reflects on all the people involved in Brennan's care, she sums up the experience in one sentence. "Seeing everything Mayo has done for him has been absolutely phenomenal," she says. "I wish I could shake all the people's hands that helped me, and say thank you to each of them. There were so many working for me, praying for me, thinking about me. I'll never be able to thank everyone," Brennan says. "It just kind of goes to show that love conquers all," he says. "It's not about money. It's not about prizes. It's about the people." Learn more about Trauma, Critical Care, and General Surgery at Mayo Clinic. Learn about Emergency Medicine in Rochester, Minnesota. Connect with other patients talking about rehab and determination on Mayo Clinic Connect.